Survey: South Australians Fed Up with Unreliable Expensive Green Power | Watts Up With That? This indicates a clear public distinction between perceived hip-pocket and job creation benefits of renewable energy and the costs of curbing carbon emissions. Support for developing renewable energy was strongest among females and people aged under 25. This indicates likely approval for Mr Weatherill’s decision to link his government with tech giant Elon Musk, whose Tesla firm has installed the world’s largest lithium ion battery near Jamestown. In the wake of a statewide blackout last year, Mr Weatherill in March announced a $550 million energy plan in a bid to stem electorally disastrous blackouts this summer, centred on the battery to store renewable energy and a government-owned power plant. Labor’s northern Adelaide heartland was least supportive of reducing carbon emissions, which was most popular in the Liberals’ eastern suburbs stronghold. Developing a renewable energy industry was most popular among respondents in the eastern and western suburbs. This survey is fascinating for a number of reasons (full survey available from the link above). The fall in support amongst left wing Labor voters is interesting. My personal impression from reading left wing sites and watching a few video speeches is that a lot of left wingers support green policies because green narratives slip easily into the left wing narrative of corporate irresponsibility. Since a lot of lefties already believe corporations are selfish, greedy and arrogant, they are very ready to believe when greens claim corporations are also messing up the planet and their children’s future. This complacent leftwing cheerleading for bashing businesses appears to come unstuck when the businesses start to break under the pressure, when lefties suddenly wake up that people’s jobs are on the line – which has been happening a lot lately in South Australia. The survey suggests South Australians strongly believe other Australians look down on them – they have a very negative view of how outsiders perceive South Australia. Despite all this, South Australians don’t appear to have entirely lost their faith. Affluent South Australians who can afford sky high electricity prices still support renewables. A substantial minority of South Australians view green jobs as being critical to the state’s economic future. I suspect Greens must still be getting traction blaming everyone else for the job losses, renewable power price hikes and electricity blackouts. Despite the job losses, the factory closures and the painful cost of living price hikes, I suspect South Australians will continue to believe the green lies, they will keep chasing their impossible dream of a renewable future for a long time to come. December 10, 2017 in Politics. The BS idea that renewable energy is all about job creation and economic growth is totally bogus. Once the ridiculously unsustainable trace elements and un-recyclable materials are assembled into wind turbines or solar panels, the fact remains that the only jobs it creates is those of the manufacture of these devices and their maintenance. The estimate for the US is that 14 million wind turbines covering twice the area of California are needed and 650 million Tesla batteries. Wow. Imagine the insane infrastructure and footprint of such overall installations. Talk about not being green, this is the least green energy on the planet. At a generous lifetime of 15 years, we are talking about having to replace 1 million wind turbines every year—realistically more like 1.5 million to more replacements per year. This is a broken window economy, adopting an unsustainable energy strategy that, by definition, creates its own needs that everyone forever needs to feed until they get a clue and trash the whole thing. With the fact that CO2 cannot warm the planet and that CO2 is greening the planet, we need more CO2 not less. IT IS PLANT FOOD. Around the world the benefits of increasing CO2 can be seen, unless you are an advocate of the AGW agenda and have to deny the benefits and pretend everything is bad. YOU CANNOT BUILD A RELIABLE ENERGY SUPPLY FROM UNRELIABLE ENERGY SOURCES. Australians should take note. What about all those jobs needed to replace the failing infrastructure and the decommissioning and new technologies that are sure to be better than the ones just written off? Lots of permanent jobs in there. CO2 makes things GREENER. !! The sooner this child-minded, anti-science CO2-hatred gets dumped in the trash where it belongs, the better. “child-minded hatred”? Is that a thing? I’ll rank it among pleonasms, so, yes, it is a thing. That’s a misquote by you. He said that the anti-science CO2-hatred is “child-minded”, which is to say, juvenile. And he’s correct. Tony, when the only way to win is by lying about what others have said, then you have already admitted that you have lost. Study from the US Census Bureau: roughly one-third of all millennials live at home with their parents and one-fourth of them can’t be bothered with enrolling in school or finding a job. South Australians want cheaper and more reliable power, but at the same time, support renewable energy, because it has not yet been clearly explained to them that CO2 is not a dangerous gas, that CO2 is beneficial to plants and all life, increases food production and increasing CO2 in the atmosphere has no discernable effect on climate. South Australia used to have a lot of industry and employment but this has now left because of rising power costs. Meanwhile, the climate of South Australia is unchanged in its changefulness. People there may soon begin to put two and two together. All you need to do is to interact with a certain Barrie Harrop, and you need not interact with anyone else. They have to take their shoes off to get to 4! If there is no evidence increasing CO2 levels result in a warmer atmosphere how can there be any evidence that CO2 is causing the apparent greening? Can’t have it both ways. CO2 is plant food. The greening is happening because more CO2 –> more plant growth. Scant warming is irrelevant vis-à-vis the much larger impact of additional plant food. Does it make sense to call O2 ‘animal food’? Cling on to “scant” James, for as long as you possibly can. CO2 levels do increase temperature, but to a minuscule degree, and increasing CO2 levels increase all plant growth independent of temperature. We do, in essence, have it both ways with CO2. Temperature increase with CO2 is limited because of its negative feedback. But we can increase CO2 levels by a vast amount without approaching the limits of its benefits. Oh yeah, you can have it both ways. 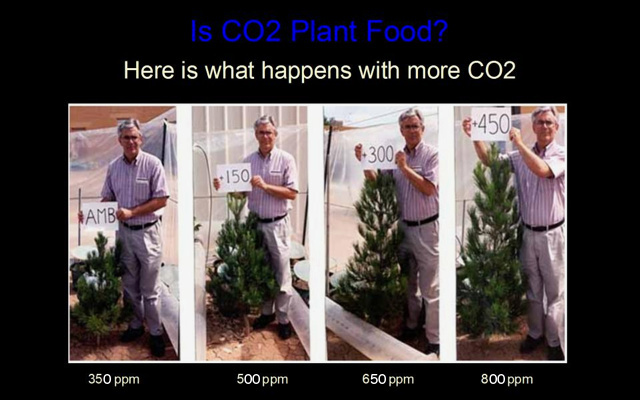 At co2 values of 200ppm plants really starve, at 150ppm they die. That there has been a little warmer on the northern hemisphere (where most of the land’s surface is located) last century, of course, also helps. That someone really believes that the ideal value for co2 should be exactly what we’ve had before industrial time (average 280ppm) is a mystery to me. That a value that is so close to what causes plant hunger, and especially C3 plants, can not possibly be the ideal value for the globe. @ mcleod… you have outdone yourself with this display of ignorance. The satellite data shows the greening which has taken place globally over the last almost 40 years. Yup Olav, abrupt climate change is really, really rare – nothing to see move along. Your ad hominems don’t bother me – as it seems some idiot actually responded. I am not disputing there has been greening. I ask the same question you ask the climate scientists: what is the evidence that shows causation? Or to put it in other words how do we know this isn’t just a correlation? Are you ascribing greening and warming to the same cause? Go into a real greenhouse some day, Mcleod, and ask them why they pump CO2 in. They will tell you it’s because it makes the plants grow much better! Are you really so stupid that you don’t know this? Carbon dioxide is one of the major items plants need for photosynthesis and growth. It allows for stronger cell development, increased fruit set – the stage where the plant’s flowers are fertilized – and fruit production. Our growers deliver carbon dioxide through tubes made of thin plastic film that run at the plants’ bases. Growers adjust carbon dioxide levels so that it seeps out gently during the day giving the vegetable plants a bath in carbon dioxide. I take it you are happy to accept the evidence that the extra greening (which you would argue is probably a good thing) has all been caused by anthropogenic CO2? If so, why not accept the evidence for its warming? Tony, what on earth are you talking about? The effects of CO2 on temperatures and the greening of Earth are two completely seperate issues. But it looks increasingly likely that the greening of Earth has been caused primarily by elevated CO2 and global warming. Whether the warming was caused by CO2 or not doesn’t change this relationship. That many people who claim to be green demonise the very thing that makes the planet green shows how mad the whole CAGW thing is. CO2 isn’t a greenhouse gas (literally, greenhouses don’t work by trapping radiation). CO2 is a green gas. I am trying to make the point that there is as much evidence suggesting CO2 causes warming as there is evidence that it causes greening. Many, and I would venture to say most, on this site seem quite happy to accept one but not the other. It is possible to carry out experiments that directly and empirically demonstrate the correlation between increased CO2 concentration and increased plant growth, excluding all other possible influences. It is not possible to do an experiment that empirically and in the absence of all other influences demonstrates that increase in atmospheric CO2 is capable of changing the temperature of the Earth. McClod, are you really this stupid? Why is it impossible for CO2 to help plants, while at the same time have little impact on the climate? Since it’s proven that more CO2 makes more plants, then it does make sense to declare that CO2 creates more animal food as well. Poor McClod, it seems that CO2-hatred has burned out his last functioning neuron. Climate change is rare, on human time scales, but it is not rare on geological time scales. In any case, you haven’t demonstrated any link between CO2 and climate. Tony, the evidence that CO2 helps plants is wide spread and well proven. The evidence that CO2 causes more than a tiny bit of warming is non-existent. Poor McClod, deep in DENIAL of the fact that CO2 is one of the FUNDAMENTAL BUILDING BLOCKS of all life on Earth. So sad..so dumb……. So McClod. What evidence??? Only exists in assumption driven models. You are welcome to produce a paper showing empirically that CO2 causes warming in our convective atmosphere. Or to remain, as always…… empty and blank. McClode is arguing from “Argumentum ad Ignorantiam: (appeal to ignorance)”. McClode’s specious “Argumentum ad Ignorantiam” claim form the basis for his refusal to accept any/all beneficial CO2 research/claims/evidence. Essentially, McClode is playing the fool, much as Laurel and Hardy or Abbott and Costello used so well in their acts. It’s good for a laugh, but don’t get caught as the straight person stuck with McClode’s fool. as McClode’s argument stands, he will refuse all evidence, research and proofs. Yet, one can lay bets he buys CO2 enhanced growth produce. It is also likely McClode is unaware that ethylene is used to ripen much of that produce. As perfectly usual for the clod; irrational to a fault. One would think that such religious advocacy would cause him to refuse all fossil fuel products and benefits. The list of goods/products and services dependent upon fossil fuels is very long. Making McClode’s nonsensical claims and stances as religious doctrine or paid trollop; well, irrational internet trollop is still a possibility. I live in SA. Very few are capable of putting two and two together and that includes engineers, retired professors, highly regarded medicos,… Logical road blocks are met with puzzled looks and then dismissed with a shrug. Comrade Jay is revered like comrade Kim Jung Un. It’s so bad it’s affecting my golf game. First world problem there 4eyes. nothing wrong with first world problems, we do still live in the first world but we seem determined to downgrade. I leave that line to the holier than thou, sackcloth and ashes types. As long as they keep getting subsidized by the Federal Government the socialist dream will continue. The Liberal Party leadership is populated with soft, small l liberals. Without a conservative leader they cannot win an election, their vote will remain split as they have lost 20% of their primary vote. Without a change of leadership there is no hope. Labor will continue to increase the size of government. It is now unsustainable. Despair is setting in. Geoff, One of the main points of your comment relates to Bigger Government and the commitment to profligate spending of current ALP/Green Politicians. So far removed from our Outstanding former Finance Minister Peter Walsh of The Hawke Ministry. If your proposal was sound, well researched, and the money was there to fund it, he would back it up big time. If it made made economic and social sense. If it was poorly researched and pie in the sky luvvie virtuosity you got shown the door. And some choice comments! Should Labor take the next election (more than likely and your noting ) something unusual will face The ALP. The Senate has refused any spending cuts and there is no surplus to be found in Treasury. Normally Coalition governments leave a decent surplus but today it is Mother Hubbard time and Labor has no Peter Walsh to demand fiscal responsibility. It will borrow even more to spend more and The Senate will roll over. It will be a race to the Deficits of all Deficits as The Renewable Target for ALP is 50% by 2030 which will ensure the coffers are stretched just by this one issue. The unfortunate fact is that the Aussie electorate seem only too happy to cheer on the Spending and Unsustainable Spree. As they should be. What a joke. The link is paywalled. But There is no indication in what is shown that this was any kind of properly designed and administered survey. As opposed to one where a tabloid invites its readers to “Have your say”. Are you saying it just like all other “climate change” surveys, Nick ? I didn’t notice the paywall sorry, I went in through Google search results. The survey itself contains a rich breakdown of questions and answers. Of course, demanding raw data would be very anti climate science. OK. But how were the respondents selected? Or did they select themselves? If they polled a disproportionate number of l i be ra ls and still got this result? The pollsters’ focus was on voters in the dozen or so “battleground states” that everyone realized were the key to the election. They focused intensely on those state-level results, and had adequate sample sizes in them. Huge amounts were spent on these surveys, which allowed them to do so. But There is no indication in what is shown that this was any kind of properly designed and administered survey. I doubt there is such a thing as a thing as a “kind of properly designed and administered survey”. The last US Presidential election showed how trustworthy polls and surveys are. The closest a “kind of properly designed and administered survey” will come to giving an close to accurate result will come from those who aren’t out to sell something, but rather from those who seek to find out what people really want to buy. According to the polls/surveys, Hillary was a shoe-in, but the US didn’t want to be put on again. So do we trust this survey? The United States is a Constitutional Republic. That means the Electoral College determines the winner in a Presidential election. Eliminate illegal voters in States and cities with lax voter ID laws (States, such CA, which doesn’t require proof of citizenship and cities, such as Chicago, which doesn’t seem to require that a voter is still breathing) and Trump would likely have won both the popular vote and the one that Constitutionally matters in a Presidential election. If they surveyed a disproportionate amount of liberals and still got this result…. Whatever. But polls poll people. And they got that right. Not all people polled are legal voters and not all legal voters answer polls. Reagan is another example of just how wrong MSM polls can be. There is no proof that there was over 2+ million illegally cast votes. Additionally, if any were cast you don’t know if they were cast for Trump or for Clinton. Well, that explains the resistance (from states such as CA) to investigating voter fraud. My last comment is in moderation. I think I understand why. This sub-topic about polls and the last US election has drifted off topic and can quickly detract from the discussions of the actual post. I will refrain from continuing down this path. I hope the other participants will also. Actually the pollsters were very much aware of the US election process and the electoral college. The predicted Hillary would win Pennsylvania, Michigan and Wisconsin which would have been enough, Trump won all three and is thus now POTUS. The pollsters are still trying to figure out why their models didn’t work. Most pollsters estimate the total vote, which they did well. That is their job; they aren’t supposed to second-guess the Electoral College process. There were few polls in those specific states – do you know who exactly predicted that? You would have us believe that pollsters don’t know how our elections work. Nick: Interesting how you can spin politics as well as climate science. You totally ignore the FACT that the polls indicated Hillary would WIN. Trying to claim “won the most votes” is ridiculous. No, the polls asked people how they intended to vote, and published the answers. They got it mostly right. People made inferences about who might win. Many were wrong. Indeed I do. But I understand how polling works too. You ask a whole lot of people how they intend to vote, and report the result. That’s all you can do, and the best you can do is get it right, as they mostly did. You can’t report from the aggregate results how that might work out in the electoral process, no matter how well you understand it. The information isn’t there. Although you can break down by state, the sample for each state is far too small to predict the result there. You can only responsibly report what you have information about. Nick S “do you know who exactly predicted that?” Here’s a link that summarizes the major polls on the eve of the election. Key state polls are included. If you lived in the US during election season you would know we are constantly annoyed by telephone poll calls and bombarded with poll results on TV. Pollsters claim to use highly sophisticated models that incorporate voting histories and demographics down to the county and precinct level to obtain representative samples. Maybe their problem is that they hired climate computer model programmers or something. They are seeking representative samples of the voters. And they seemed to do quite well at getting them. Your NYT link shows the poll average gave Hillary a 3.1% margin nationally. And her margin ended up at 2.1%. Not bad. The state polls were less reliable, having generally smaller samples. I admit I never heard an election forecast based on polls that predicted HRC would ‘get the most votes’. I do recall many predictions that she would win the presidency by a landslide, that the result was a foregone conclusion, that DT had no chance and that it was simply a matter of how big her margin of victory would be. Only one poll called it right, and Mark Steyn of course, and Dilbert’s mastermind. That one can lose while getting more than half the votes cast is not news: John Kennedy and so on. Hardly unique. It doesn’t matter. DT said that if it was a popularity contest only (no Electoral College) he would have campaigned more in NYC, Pennsylvania and Florida. It is difficult to trust polls when it is so easy to skew the result using computer sorted look-up lists that will find the ‘right people’ to ask. As I deal with surveys of opinion in my work I find that the questions are more important than the answers. Ask the ‘right question’, get the ‘right answer’. There is a lot of humbug in a poll result. National polls give votes in %. So much for Hillary, So much for Donald. That NYT average was 45.9% H, 42.8% D, with some undecided. So yes, all they say who would get the most votes. And they got it right. Rob, who exactly has investigated? How would they conduct such an investigation after the fact when by law there is no paper trail? A start would be to ensure that a state’s registered voters are in fact American citizens and still breathing. But certain states won’t release that info. Wrong on so many claims, Nick. NYTimes’ averaged and weighted polls. Those polls were listed on huffpo’s website. NYTimes’ weighted the polls based on date and sample size. All of the MSM media, circled around the HRC candidacy, went to great lengths tailoring and flavoring all news they released, to better influence the weak minded voters. Huffpo and NYTimes’ use of polls were meant to influence, not ascertain votes nor to inform voters. Nick’s focusing on a poll average giving HRC a 3.1% margin, ignores the fact that our presidential elections are electoral college based to prevent dense urban majority voting tyrannies. Exactly as the recent election of Trump demonstrates. Nationally, county by county results were overwhelming for Trump. Only those areas and states dominated by high population centers voted overwhelmingly for HRC. Most states that appeared to vote HRC were generally overwhelmed by the population center votes for HRC. County by county, state by state; voters supported Trump overwhelmingly. Throughout the 2016 Presidential election, the national and MSM conducted local polls were overwhelmingly erroneously. A result caused by the MSM pollsters themselves as newscasts of polled victims often falsely portrayed conservatives as one of many less salubrious traits; e.g. irrational, elderly, white, wealthy, selfish, etc. etc. It did not take long for many conservative to avoid, refuse, deny participation in any MSM or false independent polls. Normally, polls where one side or faction refuses to participate negates poll results. Which did not deter MSM, especially huffpo, NYTimes and other extreme leftist organizations; as they gleefully tallied then averaged their partial results into propaganda. Of course I’m ignoring all that. I’m just looking at the accuracy of the polls. They predicted the vote count, and got it right. The relation between the vote count and who was deemed to have won, is not in the hands of the pollsters. They count votes. Pollsters are not there to “count votes”; except at the most simple level. Counting votes fails utterly when a candidate fails to win, in spite of the polls. Pollsters are to determine how well campaigns are succeeding in convincing voters to elect someone. A simple number count is foolish and absurdly incompetent. That “elect someone” requires far more detail than simple numbers and averages. Which explains why quality polls have incredible meta-data depths regarding people polled. HRC’s urban vote tally gave her 62,523,126 votes. A total of 123,724,157 votes. For a difference of 1,322,095 votes; or 1.07% margin. Trump received 290 Electoral votes. HRC received 232 Electoral votes. A total of 522 Electoral votes. Trump won a margin difference of 58 Electoral votes for 11.11% margin.. Simple majority votes are excellent methods for invoking “tyranny by the majority”; e.g. three wolves and a sheep voting on what’s for dinner. Making any alleged poll announcing a simplistic total vote count estimate as absurd. Every politician, pollster and news organization knows the utter uselessness of simple vote counts. Trump’s overwhelming county by county support nationwide translates into his Electoral College win, across the nation. Unlike HRC’s extremely spotty sparse support cities. Those results are from an earlier stage in the count. The final results were 48.2% Clinton, 46.1% Trump. See here or here. 137,125,484 votes counted. Again, polls simply report the vote counts. They can’t report results adjusted for what someone thinks might happen in the EC. People who want to use the results have to do that figuring. And is there anything that makes it look like it was a poorly designed survey? Or are you assuming? Do skeptics just assume it was properly conducted without any indication? I see that it was actually an online survey “hosted by advertiser.com.au”. I see nothing to indicate that respondents were not self-selected. I asked you first. As for being a “skeptic” I didn’t say I was a skeptic. You must have assumed. OK. I see no indication that it was designed at all. An internet poll hosted on the newspaper’s website. Okay, but I think you’re seeing what you want to see. Where’s the open mind science needs? Rather than clutching at the straw you chose, you would have done better to point out that the survey showed high levels of support for more state investement in solar (80%+) with 64% believing it should be compulsory for new homes, and 62.5% want more windfarms. I conclude that South Australians are confused by the very different stories that come from their politicians (by 55 to 45 they think that Liberals would do a better job on energy than Labor), but they are noticing and getting concerned by rising energy bills and low security of supply. Claims that it is simply a one topic voodoo poll simply do not stand up. I’m not saying that it is a one topic poll. I am saying that the population sampled is unlikely to be representative of the full population. It is a sample of readers of a Murdoch newspaper who volunteered to fill out the survey. That is not a straw; it is a basic flaw. You missed te point that this survey received extensive coverage in the non Murdoch media while it was live – it is an annual talking point – and it was not hosted by them, but by SurveyMonkey. The evidence from the polled results across the mulitude of topics suggests that respondents were far from restricted to some narrow minded Sunday Mail demographic that you are trying to portray as the reality. Given the overwhelming nature of the response (over 70%), it is quite fatuous to suggest that concern about expensive unreliable power is confined to a noisy minority of Murdoch supporters. South Australia gets the politicians they vote for and deserve. If they are too stupid to see the Left lies, then they deserve the outcome. Sorry…if you care about the Earth, you have to live like a Neanderthal. Get used to it. Me? I love coal, oil, and gas…and light, and heat, and the Internet. The clash of Greenie dreams and reality. Sometimes I dream of Greenie, but then reality bites. Somehow pixie dust, rainbow sparkles, and unicorn farts just don’t cut it. I dream of Greenies but the lights aren’t there? Blue Planet II , great photography, some good comments, but also included the usual diatribe against CO2 and fossil fuels. According to one scientist, who was shown pouring dilute acid into water containing some shells and implying that acidification due to CO2 would cause all the shells in the sea to dissolve, the answer lay in wind and solar. Maybe he should keep a close eye on South Australia! “According to one scientist” I see no indication a scientist was involved in what you described. A propagandist, yes. I have previously mentioned my puzzlement that in the Ordovician period the CO2 was at 4200ppm , but the global temperature was only 2C higher than today when the CO2 is at 400ppm. If the current CO2 level is producing a sea so acid that it dissolves calcite exoskeletons , what kind of life survived in the Ordovician . Explain those facts , Attenborough . No matter the provenance of the survey, I believe it shows seniors are doing very well in SA: Relatively small numbers of +65’s have problems with jobs and costs of living. Really? The civilians are learning the price of switching to renewables before they were ready for prime time and it will only get worse before it gets better. The promise of batteries? What a joke to think we not only can build batteries large enough to power cities but that we can also charge them from renewables that can’t provide the city power they are to back up in the first place. Yes, “the world’s renewable crash test dummies” is appropriate. There is no green industry in SA and never will be. There’s a few lucky ones employed in a small number of small businesses. South Australia went for green to prove they can ‘lead the World’ in something and show they’re not dumb. Well they’ve simply proved what everyone suspected. it doesn’t make the child look grownup as he hopes. it merely betrays his ridiculous aspirations. I tried pasting on a theater moustache to get beer when I was seventeen with no success. Your comment was comical for me. But isnt that what the SA Treasurer meant when he said Tesla was “investing” in SA? Tesla jobs a plenty! Here we go again. Requiring 50 or more people to produce a unit of energy that only takes one person in the oil and gas industry is not a benefit, any more than saying it’s better to pay fifty people to make a Big Mac instead of one. Has there ever been an issue so littered with ignorance about basic math? They simply don’t teach those kinds of economic principles in Australian school. I’m very lucky I had a Czech uncle to explain the facts to me, who had to leave his homeland rather hurriedly after the NKVD discovered he was a capitalist. South OZ or all of OZ can’t make any measurable difference ( by 2100) to temp at all and Paris COP 21 is just more BS and fra-d. Just ask Dr Hansen, who also said that a belief in renewables/unreliables is like believing in the Easter bunny and the Tooth fairy. And he’s the father of their CAGW and Gore’s chief adviser. IOW it is a con , just simple maths and science. Here’s Lomborg’s PR study of the Paris COP 21 con trick. Just look at his graphs to understand the corrupt-on involved in this fra-d. Why don’t people wake up? Just asking. Of the tiny amount of CO2 that humans emit compared to the total, Australia`s share is about one percent. That`s right, it`s barely measureable. If Australia ceased all it`s CO2 emissions today, the effect on climate would be zero. This means that all our effort and expense in reducing CO2 emissions is utterly wasted. Wind and solar provide the world with about one percent of of it`s energy ; a very small amount,isn`t it ? Don`t ever forget, that your standard of living and job, largely depends on affordable power. What is happening is an example of catastrophic stupidity and incredible worldwide ignorance. I can`t wait to see the screaming as power prices cause job losses and power overloads create domestic havoc. It truly is madness on steroid, isn`t it ? My widowed sister lives in Adelaide and her eldest son is about 45 years old and has not yet left home. He is one of those professional students. Women and people under 25 are most in favour of unreliable energy genereration. A clear demonstration of the unequal availability of STEM education in the past, the feminisation of the teaching workforce, and the failure of STEM education resulting from the feminisation of the workforce. There is usually a way round the “paywall” response, at least with MSM. Newspaper outlets want people to subscribe since they now show a declining interest in buying paper copy, but they also don’t want to miss picking up some income from syndication. So the wall has holes in it. Intentionally. Do a search engine search on the title (or an approximation of it), open hits in a new private window, and in most cases one of the hits will produce the document, either as a downloadable pdf or a screen display that can be captured and pasted into a pdf virtual printer. In this case the report is 44 pages so it won’t be in the printed version anyway. This is an odd one, in that it comes up in Acrobat and other readers with a print option only. This might take a few click-throughs to get rid of. Resulting file might need rotating and scaling down to be readable. I have extensive experience in writing surveys, designing application forms etc. I am usually unimpressed by “current standards”, but this looks like competent work. There are many “leading questions” but relatively few ambiguities. 3,585 responses. How they ” …weighted by age and gender to make it more representative of the wider South Australian population” might be a bit questionable, since there are 119 questions. Likely to be biassed in favour of those with time on their hands? Large number of those in SA these days. No indication as to how they avoid this being “stacked” by those with an agenda. I would become irritated after a few questions. The weak minds shall inherit the dearth! ..while grumpy old STEM heads like me now have an emergency full sine wave generator with a store of potential energy. Seems to me that the people have the power to change things. If they chose not to, it indicates that they are willing to suffer these deficiencies, for whatever reason. Johnson said many years ago ‘There is a powerful lot of ruin in a nation’. The South Australia experiment again verifies his wisdom. Yes but unfortunately with thermal power stations you have to have a clear 25-30 year vision and by Groupthink believing you can make a reliable system from unreliable componentry has seen existing ones run on sticky tape and string to extract the last drop of revenue out of them before they close. When you witness your State Premier rushing out refined fossil fuel generators with taxpayer slushfunding the penny should drop but alas all those red faces and obfuscation with a unicorn battery. How sharper than the serpent’s tooth it is to have a thankless child eh PM? The person who caused the worst IT disaster (CBA) in Australia in 2012 lives in Adelaide. This is straight out of Atlas Shrugged, which is straight out of Ayn Rand’s experience growing up in the Soviet Union. Leftist policies make things worse, but the leftist leaders blame the producers, calling them greedy and crooked. The people, charmed by they promise of a utopian state, double down on the leftist policies, and continue to blame the producers for all the problems generated by the state. The producers eventually give up. Poverty and misery become the status quo, while all wealth generating, capitalist ideas continue to be demonized. Humans are far more predictable than the climate. We do the same stupid things over and over again, always expecting a different result, but never getting one. As a species we need to give up on the idea of engineering society. What we call “society” is really an emergent property of people interacting with each other. The better we are as individuals, the better society we will get. Efforts to make people behave better and force certain outcomes only distort society and ultimately induce the very evils we wish to abolish. Humans can’t have utopia because we are flawed, so our society will be flawed as well. The best we can hope for is a level playing field where everyone has a chance to make the most of their talents. In such a system, outcomes will still be unequal, but at least if you fail, it will be your own fault; not the system holding you down. “Weatherill has yet to admit that the closure of Northern power, with the loss of 520 megawatt generating capacity, had anything to do with the blackouts that have afflicted SA for the past 18 months. Instead he points the bone at dark, malevolent forces. He accuses the power companies of “pursuing profits at the expense of reliable, affordable power”. He denounces the mendicancy of neighbouring states. A blackout last December was caused by “a fault on the Victorian side of the border”. He blames the Turnbull government, claiming “South Australians have been let down by a broken National Energy Market”. 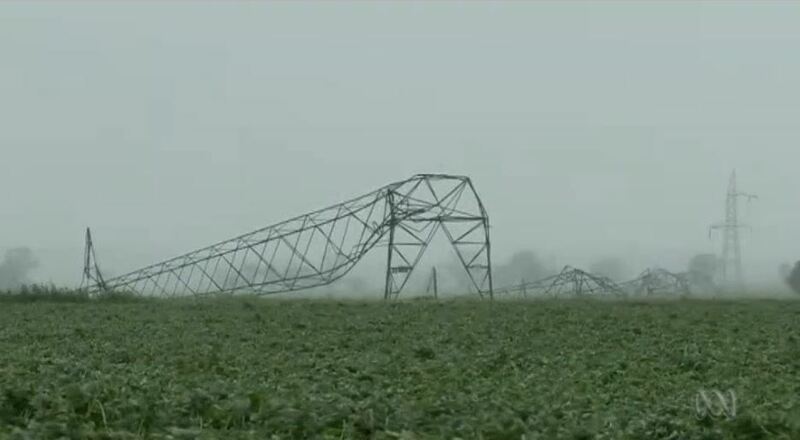 Most of all he blames the weather gods, who deliver their wrath more frequently on SA than any other state, directing mighty winds and lightning strikes to the weakest points about the grid. SA govt are just plain crazy. Instead of paying A$8m. annually to keep the northern power station running, they dynamited it and then paid hundreds of millions of dollars for wind turbines, then a big battery and now polluting diesel generators which run on imported diesel. And they won’t tell anybody how much they actually paid. On top of this they have adequate unused gas reserves. Like most government boondoggles, they will expand both so-called green energy and eventually – without fanfare – reliable base load that supplies energy when the green energy goes brown. They can show off their wind farms and just ignore the costs of having both, passing those on to the consumer. If you can keep taxing people more and more, then slowly raising their energy prices should not be any more difficult. Many people are either are willing to pay more, or too dumb to realize what is happening, or just not focused enough on any one thing long enough to do something about it. And for those that are paying attention, if you can’t control the elections then you are just out of luck – I am really sorry. I keep hoping the U.S. will re-discover nuclear power, produce a standardized reactor, and build truly reliable energy generation plants, but in the meantime there is plenty of fracked gas here to burn (and coal if gas runs low). California may black out, but most of the U.S. isn’t that far into the tar pit. The propagandists have been very successful at fooling the young. Australians have changed . They used to have such a low tolerance for politically correct BS but at least thousands won’t be dying from fuel poverty deaths like the climate conmen in the UK have caused each year . How a massive criminal lawsuit hasn’t been launched yet is a miracle . The Aussie education system has changed. When I was a kid teachers had a bit of fun, there was scope for personality. For example, after corporal punishment was banned, I brought in a high voltage electric zapper to primary school, fun toy for sending a shock through 20+ people holding hands. My teacher’s question was “does it leave marks?”. Very well behaved class that day. When I got into a fight with the school bully, and gave him a smack on the nose so he cried, one of my teachers said “good”. Unimaginable that would happen these days. Teachers could teach kids how to read and write, instead of having to follow the curriculum, the ghastly word recognition programme which results in a lot of people younger than 45 have trouble distinguishing between words like “lot” and “lost”. They have been taught to take a quick glance at the word and try to guess what it is, rather than honing their brain to read the letters very quickly and match the letters in the word to their memory of the word, or sound the word out if the word is unfamiliar. Nowadays Aussie education is all about indoctrination and social consensus. Occasionally you get a good teacher who strays a little from the official agenda, but without lots of support from home Aussie kids these days turn into brainwashed conformists. I’m very disappointed that WUWT hasn’t seen fit to publish news of the completion of the 100MW Tesla battery in South Australia. I’ll stand corrected if I missed it….. It it works reliably, safely and without excessive degradation over time, and delivers on the promise of increased stability of the grid, then I feel that this could prove to be the start of a movement _requiring_ that wind farms include some form of predictable, buffered supply. If it falls on its face, or goes FFZZTTT-BANG when it gets wet, then that’s an important result too. Whatever the outcome, here’s an actual live site in use and we should be keeping a close eye on its workings i.e. efficiency (energy in vs energy out), charge level (%age of capacity), voltage/frequency stability and ability to actually supply on demand. Totally agree with all your premises here but then why roll out the diesel generators if such battery installations can solve the fickle wind problem reliably? Don’t all the Green experts believe they can in the march to 100% renewables? Haven’t they done all the homework on that before deliberately bankrupting reliable thermal power stations and trashing the communal grid? Or is it really the case they didn’t have a clue what they were doing and need to be tarred and feathered and run out of town? @observa – re generators if batteries work. I think that’s the big question that this installation may provide the answer to. Does anyone know whether such statistics are available (along the lines of the Templar UK Grid watch site)? Um……You really don’t need to wait for the result. It’s entirely predictable to the technically numerate.. We have design engineering. Just find out the expected demand in KWh over a worst case period of no renewables, assuming no top up. Multiply that by the Powerwall 2 cost of USD 400/KWh, and you have the 4 yearly replacement cost, roughly. Storing converted diffuse electrical energy as another form of enrgy, then regenerating it later, cost a humungous amount of money and consumes massive resources, mostly not renewable if Li-Ion. Lead acid is better in fact. Trying to back up the grid with mobile phone technology developed for quite another purpose is a daft idea. In fact a wholly unnecessary solution to a self imposed problem. Electricity generatio doesn’t work like that. It gets seriously self harming once you depend on renewables with duty cycles under 50% for most of the supply. None of it makes any sense in economic or energy supply terms for South Australia. They need nuclear if CO2 is a real worry for them, even if it isn’t really. They have a huge emptiness of a sub-continent no one wants to live in to put it in, with solar offset to match up to mid day a/c peak loads. Simple and effective, minimal storage required – and no subsidies. Because this rational solution would just work, matching supply to demand in real time, at zero CO2, it don’t need no steenking subsidies, nor storage. You can see the battery in operation real-time on the Aust. NEM website. Apparently it has been through a number of 30MW discharge cycles. It’s difficult to know whether it is achieving its objective because the SA govt won’t tell us exactly what it is supposed to do. One statement was that it is supposed to provide 70MW for 10 mins, which if occurring regularly would seem to shorten the battery lifetime. I think all I am seeing is the 30MW dedicated to the windfarm (no recorded charge or discharge above 30MW): so far it has seen little action, which is perhaps to be expected while they test and commission the facilties. I think they fully charged it today for the first time, but I’ll need to check the detail of how long it was charging for. I think the data I see are simply spot readings every 5 minutes, which makes it hard to be certain what it was doing in between readings. I plan to keep an eye on it and analyse its visible use. Update: I have now seen the battery used at 100MW charge and discharge rates, and charged fully (nominally more than full at around 150MWh, but it probably reflects system losses rather than extra hidden capacity). Still subject to the caveats of reading too much into 5 minute spot data. Having worked in different areas over the years with different designs of power grids I find the idea of a battery back up system laughable for a number of reasons. In an islanded or isolated system batteries will provide some power for finite time. In the case of South Australia I am sure in a power upset of the major grid of the region will force South Australia into an island mode as the rest of the country sheds it like a unwanted brother in-law. At that point the batteries will take the increased load and begin their discharge decline. If you look at a normal power outage it takes about an hour on average for crews and operators to respond to find the source and to begin to reestablish a stable supply. If it is a quick fix then power maybe restored in an hour if it is a bigger problem then it maybe beyond the batteries capabilities and then the grid goes black. Common sense and design criteria for the battery design and specifications. Look at Puerto Rico for the worst case. Once the power is restored there is an inrush and a heavy demand which is brought on by the system that is trying to regain its equilibrium as quickly as possible. Think of it as every fridge and freezer comes on to try and reach there cooled set points. In the north countries it is furnaces that peak the demand. Now throw in a bunch of depleted battery banks into the mix and the grid recovery becomes longer and more unstable. When running an island system there were times when the demand of the inrush after a power failure caused another black out due to over loads. The answer would be to have control of the charge rates of all the batteries from a central point but that again raises the complexity of the system. In 2007 there was a blackout of the eastern seaboard of the US and Canada that was caused by a power line hitting trees due to over load and temperature on a small feeder line. The master plan and control program for the central power grid control center in Indianapolis had never been fully tested and when it was needed it failed miserably. Full power was not restored in some areas for at least 2 to 3 weeks. Instead of batteries they should install Gas turbine peaking units. One site we installed would bring on 170 MW in 17 minutes from a cold start. Gas turbines would be better if the wind stopped blowing on their wind mills for a length of time. Boris please consider turning this into a post, send a detailed writeup of the issues to Anthony. It never occurred to me that batteries could make things worse, I thought they were useless, not problematic. I believe that the use of lithium batteries is wrong for grid backup, where you could expect a number of high-current discharges to be required. There are a lot better battery choices to support these types of high-discharge loads. Perhaps that poll result shows that the under-25s have passed through the “education system” during a brainwashing period, with little exposure to logical facts. It would take quite a strong personality to disregard all of the nonsense spouted by Gore, the Green Blob, Hollywierd, most of the MSM, and the technically illiterate politicians.